Nowadays, MQTT is one of the most widely used protocols for IoT (Internet of Things) deployments. It utilizes a lightweight publish/subscribe messaging model, which is optimal for machine-to-machine (M2M) connectivity, especially in conditions of a low network bandwidth and/or limited resources capacities. Herewith, the base of any MQTT infrastructure is represented with a central messaging broker (server), intended to manage notifications interchange, and connected to it instances (clients). 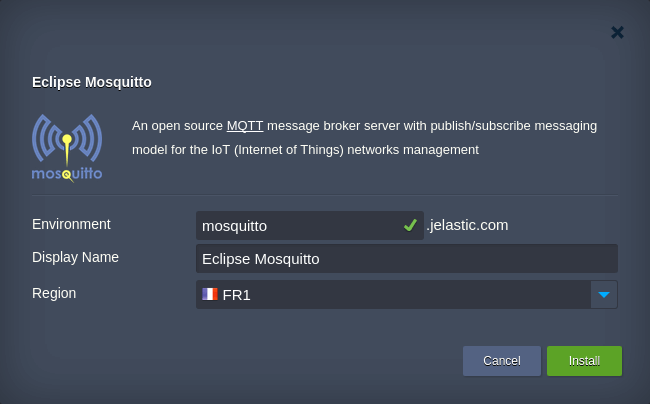 In this article, we’ll consider the Eclipse Mosquitto one-click installation package by Jelastic, which allows to set up such MQTT broker in just a minute. Being designed to handle a big number of simultaneous clients with minimal RAM usage, this solution is equally suitable for administration of both full-powered machines and simple sensors or actuators. 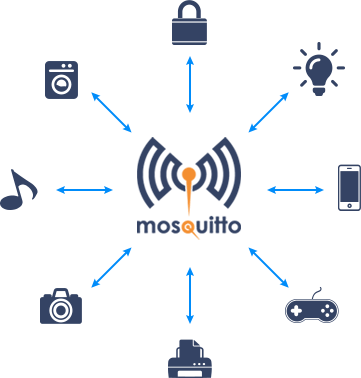 So, let’s investigate how to quickly get your personal Mosquitto message broker inside a Cloud and to take the full control over all devices in your IoT network with its help. The MQTT protocol principles are somewhat similar to the client-server model, since it’s operating with a single central broker and multiple clients, connected to it. Herewith, all interaction is performed through the subscribe/publish messaging. This allows to keep publishers and subscribers (i.e. clients) unaware of each other, as they are never connected directly – through the MQTT server only. With pre-packaged Eclipse Mosquitto solution by Jelastic, all the required actions on server setup and the appropriate software installation are accomplished by the system automatically. The only thing you need to do is to initiate the corresponding package deployment – let’s consider this in more details. 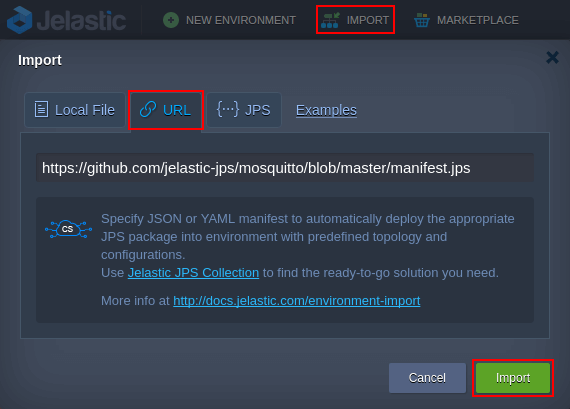 https://github.com/jelastic-jps/mosquitto/blob/master/manifest.jps Click Import to continue. Click Install and wait for Jelastic to configure everything for you. 3. In a minute, you’ll see a popup frame informing you about the successful package installation. That’s it! Your Eclipse Mosquitto broker is ready for work now. Subsequently, the provisioned domain name and required port can be used to connect clients to this MQTT server. Now, let’s consider a simple example of MQTT messaging through the Eclipse Mosquitto server. To follow the tutorial below, you’ll need several MQTT clients (i.e. devices to constitute your IoT network – we’ve created a set of containers within a separate environment for this purpose) with the mosquitto-clients package being installed at each of them (is required to enable execution of the subscribe and publish commands). So, let’s see how to accomplish such device interaction. Tip: If working within Platform internal network, the port value can be skipped – the 1883 one will be used by default. Great! Everything works fine and you can enjoy the just-made hot toasts right after your arrival. 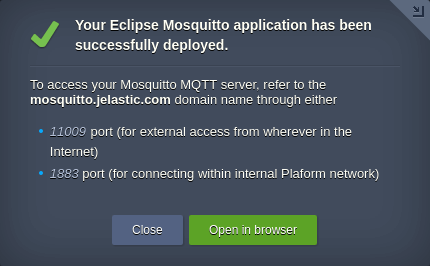 Although that’s just the simplest example of IoT networking implementation through the Eclipse Mosquitto message broker, it’s enough demonstrative about the capabilities and benefits this tool provides. Use it as a base to build your own, more complex IoT solutions within Jelastic Cloud right now! Need any assistance on Eclipse Mosquitto installation or maintenance? Write us at Stackoverflow and Jelastic technical experts will do their best to help you with the met issues.